"My rival has arrived!" 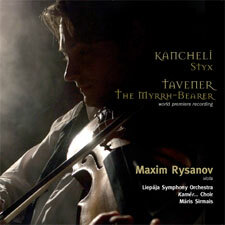 Yuri Bashmet purportedly exclaimed, when asked about Maxim Rysanov. 28 year-old Maxim, like Bashmet is from the Ukraine: earlier this year his Avie recital disc was named Editors ‘Choice in Gramophone and raved about in Fanfare; later this year he stars on a duet disc with Janine Jansen on Decca and tours with Rachlin and Maisky in Bach’s Goldberg Variations. His other regular chamber partners include Vengerov, Kremer, Mullova, Hamelin…!! He is just announced as a BBC Young Generation Artist 2007-8. Rysanov’s ONYX debut is of two extraordinarily beautiful and haunting works for viola and chorus/orchestra: both written for Bashmet, and the Tavener is a world-première recording! Giya Kancheli’s Styx is already renowned as a choral masterpiece for the 21st century, The River Styx in Greek mythology separates the living from the dead and the solo viola mediates between the two. John Tavener’s The Myrrh-Bearer is another epic, this time based on the Troparion of Cassiane, a Byzantine poet and composer. Here the viola represents the sin of Mary Magdalen. Both works were recorded in the amazing Dome Cathedral in Riga, Latvia, the largest medieval church in the Baltics, has just the right expansive acoustic for this music. Styx: VII - Time! merciless time!